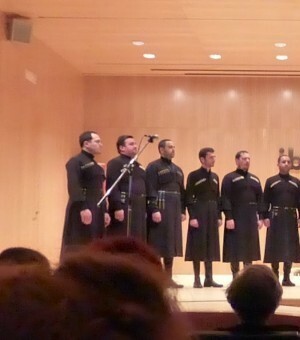 "A slice of Georgia in Zaragoza"
How lucky to enjoy the songs of Georgian male voice choral group "Ensemble Basiani" , which acted on February 24 in Zaragoza, invited by the Vocal Female Enchiriadis group. I had not heard of this choir, but had clearly not me I would lose the performance. Wanted to attend and remember the trip we make to Georgia in 2011 coinciding with Easter or Easter Orthodox and opened this blog with the story of the trip . Georgia, located in the Caucasus between Europe and Asia, we were surprised and we remained gripped. I do not know if it was the towering mountains of Svaneti, the plonk of toasts with tamadas , overcrowded and folk churches during Orthodox Easter, the taste of khinkalis, which makes my mouth water to remember or beautiful monasteries in mountains, whatever, Georgia sorry nearby and we always like to remember. Ensemble Concert Basiani For that reason we went to see the concert of "Ensemble Basiani", the chorus of the Patriarchate of Georgia and the Cathedral Sameba (Tbilisi), created in 2000. It is composed of singers from different regions of Georgia, most college of music, and families who have maintained traditional singing. The concert entitled "Religious and secular Polyphonies" did not disappoint, rather intoxicated us with beautiful religious and Georgian polyphonic singing profane, sometimes seemed whispering harmonics in a contained breathing room to not break the charm, combined with the beautiful of throat singing rightly place this group among the most unique sound expressions UNESCO World panorama l. . Songs that reflect a tradition that has been maintained over time and that the research and study of the sound files may have not lost The concert program is a journey through the regions of Georgia.